You have joint pain, and your doctor recommends an MR arthrogram. WHAT IS AN ARTHROGRAM? you wonder. ARE THEY CHECKING ME FOR ARTHRITIS? WILL THEY CUT ME OPEN? IS IT LIKE A COLONOSCOPY FOR MY KNEE?? While an athrogram is a technically advanced MRI scan, the name is far more intimidating than the procedure. Read this blog post to learn everything you need to know. 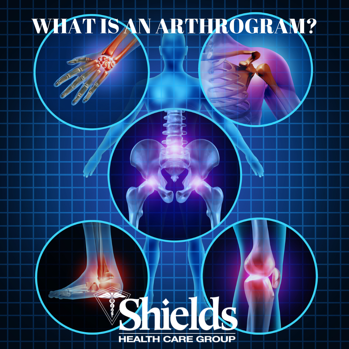 Here at Shields, we perform arthrograms every day, all across New England, so we're happy to reassure you with detailed information. MRI is sophisticated technology that uses a computer, a high-strength magnet and radio waves to produce high-resolution images of bone marrow and soft tissue (your organs, muscles and skin). MRI has been safely used for decades to provide doctors with valuable information to help in the early diagnosis and treatment of disease. An MR arthrogram is a further refinement of the technique that provides your physician with specific information about joint structures -- characterizing the condition of ligaments, tendons and cartilage in shoulders, knees, elbows, wrists, hips and ankles. An MR arthrogram is a painless two-part exam that lasts approximately 90 minutes. You should plan to be at Shields for approximately two hours, to ensure adequate time to register and prepare for your exam. When you arrive for your appointment, a technologist will bring you into the fluoroscopy room and explain the procedure. They will numb the area that needs to be scanned with a local anesthetic. Once the area is numb, the joint will be injected with a small amount of a contrast agent. If you receive therapeutic injections for pain management, your doctor can request that we administer these at the same time as the contrast, saving you time and additional injections! Following the application of the contrast agent, several X-ray images will be taken. Once these are complete, you will be taken to our MRI suite for the scan. During the scan, you can relax and listen to music while the images are being taken. The MRI machine will make a loud, rhythmic, tapping sound as it creates the images. No special preparation is needed for an MR arthrogram. You can eat and drink as you normally would, and should take any regularly prescribed medications. If you have had an allergic reaction to contrast agents, please contact your referring physician, as he may recommend a different diagnostic procedure. If you have bleeding problems or are currently on anticoagulants, such as Coumadin, inform your doctor before the scheduled exam. Most patients will feel minor discomfort, such as joint stiffness, that may last for several hours following the exam. Avoid aspirin, as it can cause a slightly increased chance of bleeding. There are usually no major side effects with this exam, so you can immediately resume normal activity. If pain and discomfort last for more than six hours, you may take non-aspirin, over-the-counter pain medication. If the pain continues for more than 24 hours, or if you develop a fever or have significant bleeding, please call your doctor immediately. Following the test, our MR technologists will review the images and prepare the information for interpretation by the radiologists. The results will then be forwarded to your physician, who will evaluate and discuss the results with you. We understand patients are anxious to receive the results of their scans, but keep in mind that Shields and its employees are not authorized or trained to discuss the results of your scan with you. This is where your doctor comes in! Shield has a network of more than 20 convenient locations that offer MR arthrograms, so there is always an appointment available, quickly. When your doctor tells you you need an arthrogram, ask if they can schedule yours at a Shields facility. CLICK HERE to read about a patient's experience getting a hip arthrogram for chronic hip pain. CLICK HERE to read more about Shields advanced MRI technology.